When first entering your child into care, it can be daunting and you may have many questions. That is completely normal as you are going to be leaving your child in someone else’s care. As a parent, you need to feel confident in the centre and team. Therefore, we have devised a checklist guided off CareforKids Australia, to assist you in making your decision. Physically visiting a centre will help a lot in making your decision. At the centre you can ask all your questions, meet the educators, prepare and experience the overall feel of the centre. At Kids Club, we offer an orientation week when you can come with your child as much as you want to get them to know their new environment and carers. 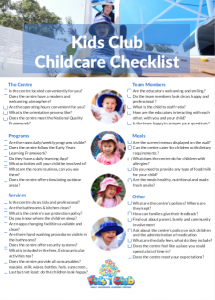 Click the image to download the Childcare Checklist.